10 times Book Box Club made us feel FANTASTIC! We’ve spent the last week in serious Book Box Club planning mode and we are feeling very upbeat about it! When even budget meetings include drinking cups of tea, snacking on jaffa cakes and chatting all sorts of exciting things with your best friend, suddenly boring spreadsheets end up seeming much more fun! Getting the chance to run our own business makes us feel very lucky and although there have been lots of late nights and hard work – we wouldn’t have it any other way! 1.) Getting amazing feedback from our lovely members – Every time we post out our boxes we turn into crazy stalkers on social media. We LOVE seeing all of your unboxings and hearing all your excitement. Highlights include seeing unboxing stories involving animal helpers. Cats, dogs and even chickens have all proved to be brilliantly glamorous assistants! Seriously, though, your unboxing enthusiasm rocks! 2.) 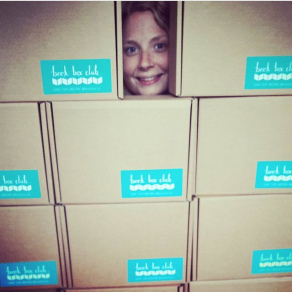 Box packing marathons at Book Box Club HQ – There is no denying; the week before our monthly parcels go out is a very busy whirlwind. There are books to wrap, scrolls to roll, gorgeous items to package up and lots and lots of blue shred flying around. There is nothing more satisfying than seeing the post bags go out the door and we have a bizarre love for the hours of sing alongs, spreadsheets and processing tasks – especially when we get to do it together. 3.) Book group meetings in The Clubhouse – Every month we have a blast chatting with you guys at our book group meeting! If you’re a member, but you haven’t made it to a meeting yet then you really should set yourself a reminder for the next one, whether you’ve read the featured read or not. Our club is a very friendly space, that welcomes all – whether you’ve got tonnes to say or just want to soak up the bookish vibes. We have had some awesome discussions about writing techniques (“spending hours in the shower is great for creativity” – says Laura Ruby, author of Bone Gap), current reads (which always ends up with long lists in our notebooks) and, of course, getting lots of inside scoops about our featured reads. 4.) The books! 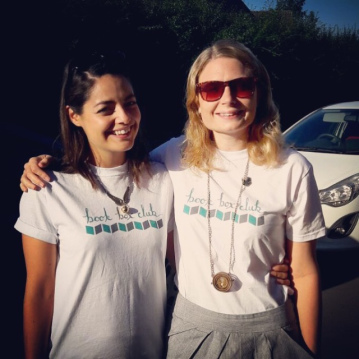 – It’s no secret that both of your Book Box Club founders are unashamedly bookish and at the moment we are spending every spare second we have with our noses in lots of exciting reads. We spend a long time deliberating over which books we want to include in our boxes, because it is really important to us that we LOVE every featured read. We just can’t get on board with recommending books that are a bit ‘meh’! This means every month we reads lots of different ARCs to find exactly the right one. We only start thinking about themes and box items when we’ve agreed on the perfect read because, for us, the book is THE MOST IMPORTANT thing! 5.) 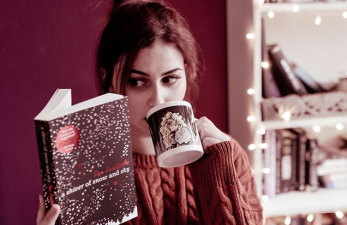 Seeing people using the items from our boxes – One of the cool things about owning a book subscription box is that we get to buy so many bookish goodies! Every month we do lots of browsing and discussing ideas with talented crafty people and seeing an item that you have been a part of designing and commissioning is really exciting and rewarding. Whenever we open a delivery of items for one of our boxes we are straight on the phone so that we can both fangirl over the beautiful bookish items at the same time! Some of our favourite items ever have included in a Book box Club box have been our Osa Mug illustrated by Sandra from Four Seasons Fox for our Quests and Legends October box and the beautiful bookish calendar that Kate put together using all the gorgeous artwork submitted by the winners of our illustration competition. We are so proud of how it turned out! 6.) 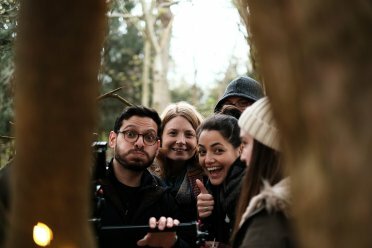 The glitz and glamour of a Book Box Club theme reveal – Each month we reveal our next month’s theme via bookish trailer and if it were not for our very patient filmmaker Hakan, this just wouldn’t be possible. A lot of hard work has gone into filming our trailers over the months and, let me tell you, many of them were not as slick behind the scenes. My (Libby’s) attempts at making a delicious looking picnic for our August Fearless Females film ended in lots of grated cheese all over the floor and an exploding bottle of pink lemonade. On the set of our Haunted Minds November theme reveal Kate and I had to be banished from the area because we inadvertently kept making our bookish model Sophie giggle, when she was supposed to be gazing thoughtfully into space! Sorry Hakan! We are in the process of organising our next filming session and we can’t wait to get storyboarding and location scouting (wow, we are so Hollywood!). 7.) Making friends! – Yes, one of the great things about the online bookish community is all of the lovely like-minded people out there. We love that we have so many members/authors/reps/crafters who we have met on this journey who we can now call friends and having all that unflinching support is such a massive boost! Every box we curate is a team effort and we get to work with new talented people every month. 8.) Making exciting plans – We are the type of people who love making plans and dreaming up hair-brained schemes. We have so many great things that we are discussing that will make Book Box Club even better. 2018 is going to be a BIG year for Book Box Club! 9.) Working with your best friend – The first thing that we decided when we talked about starting our own business was that we wanted to spend more time together. That’s really why we came up with the whole idea of Book Box Club and we have such a blast. We spend most of our time laughing. Now, we tell each other absolutely everything – from selfies of minor injuries and bad cups of tea, to hour long dissections of our current read. If you guys very get the chance to work with a bestie, we’d highly recommend it. 10.) Feeling like total girl bosses – Don’t get us wrong, there are days when where we forget to have dinner and we don’t get a chance to brush our hair but nothing beats the feeling of accomplishment when those monthly boxes go out in the post. It’s hard work but it’s totally worth it. We’d love to hear about some of your Book Box Club best bits! We have made so many great plans over the past week that we know that we have so many more ‘best bits to come.